Seven years ago a peaceful uprising against the President Bashar al-Assad in Syria turned into a full-scale civil war that has so far left more than 350,000 people dead, devastated cities and displaced over six million people. In 2015 Care4Calais worked with many Syrian refugees in the Calais camp. However, since Europe signed a widely criticised and inhumane deal with Turkey in 2016 that trapped millions of Syrian refugees in Turkey and Greece we have seen numbers of Syrian refugees in France drop drastically. In 2017 Care4Calais began working with Anaya Aid to send women and children’s clothing to refugees in Syria. We often receive more women and children’s clothes than men’s clothes, and yet we have a greater need for small men’s clothes in France. 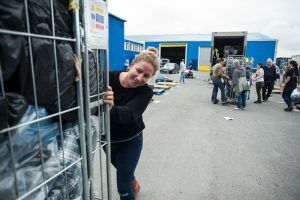 Thanks to Lopa Removals who transport the sorted items from Calais and Anaya Aid who then ship these onward, we have sent multiple loads to Syria.